And those are recyclable paper cups and wrappers, tho' I don't know if the lids are #1/#2 or something else. 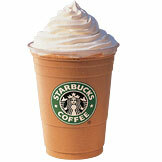 Looks like Starbucks needs to talk to Moscone Center. "... we get more customer comments about recycling than any other environmental issue - especially when it comes to our cups ...."
"... Put bottles & cans into marked recycling bins. Throughout the show, deposit your glass juice bottles, aluminum soda cans, and plastic water bottles into the marked recycling bins. No Starbucks cups are allowed! ...."
"... • Compost – All SAVOR’s disposable serveware is compostable. 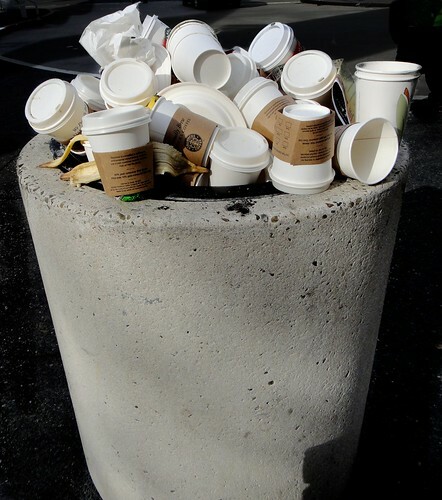 Compost is collected at large catered functions in clearly marked bins...."
So why were the climatologists using the ashtrays for Starbucks cups? Someone's failed to realize that meetings nowadays run more on caffeine than nicotine? Hey, complete with cinnamon sprinkles! So there's composting collection only at the major events, which explains the cup ban at other times. Lame, but OTOH they're still far ahead of most. Of course those sleeves are fine for the paper bins. IMHO people should just bring their own cups and there ought to be signage to encourage it. I have a probably 10-y.o. stainless steel Starbucks cup that I take everywhere I go. It's got a hard rubber-coated handle and bottom that will deteriorate eventually, but based on experience so far it seems to be durable enough to last about as long as I'm likely to. Jules, your best pix yet! Hank: Well the AGU is a broad church so probably it was the oil company funded geologists who thoughtlessly tossed their bux mugs into the ashtray. Is it really an ashtray? It looks awfully large for an ash tray... But then everything is so awfully large in the USA. Jules, Pullman has had a curb-side recycling program for 20 years now and we certainly were not the first. Believe it or not, SF has the best collection program in the country. Had you kept your eyes peeled, you would have seen composting collection bins here and there. It's mandatory for food-related businesses (inc. coffee houses) and all residences. BTW, there's a good chance the cups in the hotel room bin would have ended up in the composting stream. You could have, you know, asked the management about it. No. Recycling has to be idiot proof. We never did work out how to do during 2 months of being in the UK last year, as the bins, the signs and the council website were all contradictory. The people couldn't help either as apparently the rules are all different all over the country. It's funny cos "foreigners don't understand our recycling" is an oft-heard Japanese refrain. Whereas in fact the recycling here is pretty straightforward once you learn it, but just about every time a new (Japanese) neighbour has moved in, they have cocked up once or twice before getting the hang of it! I too think this is a most powerful photo.